Lyn can help you with all you property management needs. 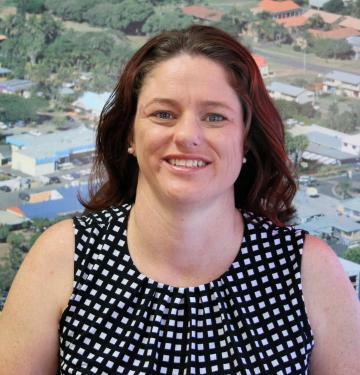 Lyn has been in Real Estate for 10 years moving from Darwin in the NT. Lyn and her partner chose Bargara to raise her children because of its great lifestyle. Lyn's people skills are second to none with an eager and friendly attitude. This stylish 3 bedroom, 2 bathroom fully self-contained unit is directly across from Bargara Beach and the wonderful turtle park playground where the kids love to play. Spacious enough for a family. Complete with a large balcony that overlooks the ocean and can be closed off at night for privacy. This Queenslander style home is perfectly situated on an 1100 square meter block half-way between beautiful Bargara and the city of Bundaberg. The main house oozes charm consisting of 4 spacious bedrooms and 2 bathrooms. Separate lounge and dining, timber floors, 10 foot high ceilings with air conditioning and ceiling fans. Adjacent to the house is a one bedroom granny flat featuring its own kitchen and bathroom perfect for guests, extra family members or an unruly teenager. Huge 3 bay shed and established gardens. Move straight in or the ideal renovator. Contact Paul Beer 0414 592 708. This is a once in a life time opportunity to purchase a sound investment in such a unique location at a never to be repeated price. Situated on the Lagoon at Kelly's Beach these 4 x 1 and 2 bedroom units are currently all permanently tenanted through Bargara Real Estate. Close to shops and patrolled beach in central Bargara. There is no other block like this in Bargara contact Paul for an inspection 0414 592 708. FIRST TIME TO THE MARKET. This Kelly's Beach Front Property is one of a kind,boasting 1619 m2 of absolute Beach-front land. Huge Brick Home plus 2 x 2 Bedroom Duplex overlooking Golf Course. Ideal Development Site With Approvals in Place for 9 Luxury Units. Properties like these in this position rarely hit the market. The property features: *Brick exterior with quality tiles and carpet throughout. *4 bedrooms all with built -ins and fans. *Main bedroom with ensuite. *Open plan kitchen including dishwasher. *Open plan living and dining. *Outdoor undercover area and rainwater tank. *Fully fenced/turfed and security screened. *Side access for boat or caravan. *841m2 allotment. *Ideally located close to shopping facilities. Situated directly on Kelly's Beach, this stylish apartment 'Rockpool' is the ultimate possession. Set on the ground floor for easy access to the beach and pool. The apartment boasts 3 bedrooms, 2 bathrooms and underground parking for 2 vehicles. Open plan living with modern appliances stone bench tops and a spacious deck overlooking the the beach and pool, makes entertaining delightful. Great location walking distance to Bargara's shops and restaurants. Secure your piece of paradise call Paul 0414592708. When position counts it doesn't get much better than this situated across the road from the Burnett River at the Port of Bundaberg this home has it all. Gateway to the Great Barrier Reef, boat ramp, family friendly area. Close to Bundaberg City, Schools, Buses, and Patrolled Beaches. New to the Market Inspect today. Phone Exclusive Marketing Agent Paul Beer 0414 592 708. This exclusive apartment block has only five units available with a massive floor space of over 200 sqm. If you are looking for location, lifestyle and luxury with ocean views to die for, you can't afford to miss this. Featuring 4 bedrooms, 3 bathrooms finished with quality fittings. Just a short stroll to Bargara Golf Club, cafes, restaurants and shops. Contact Paul for an exclusive inspection today 0414 592 708. Penthouse at The View in the centre of Bargara. Words can not describe how amazing this property is. Featuring 4 bedrooms, 3 bathrooms, on the 5th floor with stunning 360 degree views of the Bargara coastline makes you feel like you are in your own world. Great family home in a quiet cul-de-sac, 4 bedrooms, main with walk-in robe and ensuite. Spacious living areas, modern kitchen, air-conditioning to the main bedroom and living areas, fenced yard with pet on application. Close to bus routes including school buses, walking distance to Riffle Range Beach. Tenant vacating on the 28th October. 3 bedroom unit, fully furnished & self contained, main bedroom with ensuite, open plan living & dining, air conditioning through-out, all bedrooms with built-ins, only a short walk to the beach! Available after 23rd December 2014! This beautiful family home is situated in a quiet cul-de-sac only 200m from Kelly's Beach. Offering 4 bedrooms all with built in robes and ensuite in the master bedroom. Two separate living areas, a modern kitchen with a dishwasher, induction cooktop and a Blanco pyrolytic self cleaning oven. Undercover outdoor entertaining area has sun blinds for year round entertaining, and a back yard big enough for kids to run and play. Double lock up garage. Available 19th of December 2015. Don't delay this property will not last long.